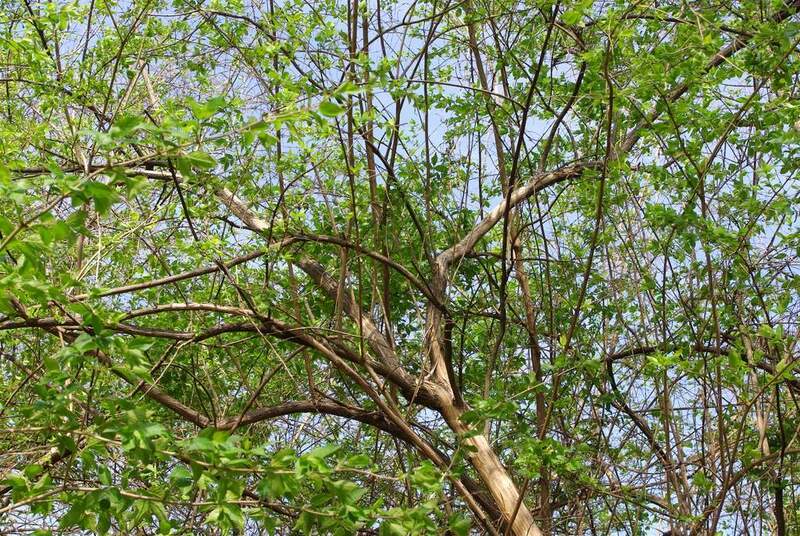 The greening up of the garden in spring is such a welcome sight: perennials emerging, bamboo leaf buds growing, but the biggest impact is always provided by the trees and shrubs. When they leaf out, the yard is almost instantly transformed from primarily brown to overwhelmingly green. Plus the shade comes back, and there's more privacy, at least in my yard. 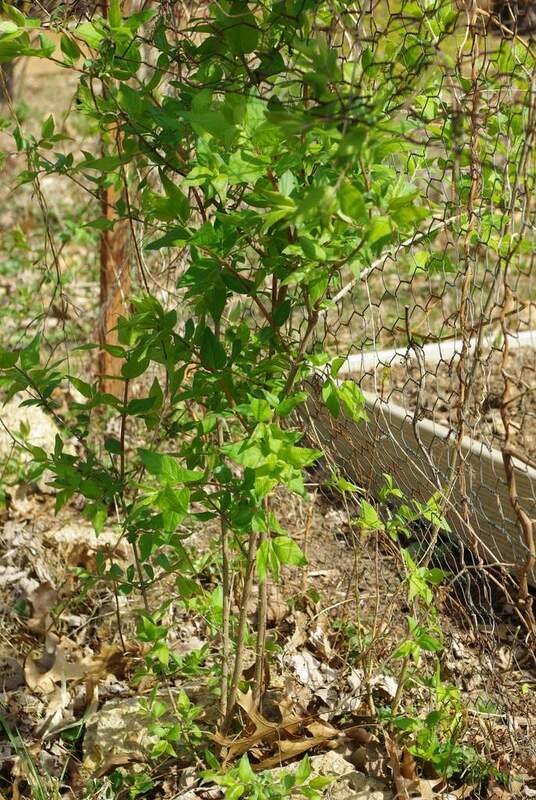 Unfortunately one of the first shrubs to leaf out is a bully -- an invasive species that's taken over such a large percentage of Missouri's woodlands. I'm talking about bush honeysuckle. There are a few different species of these plants that are problematic and I don't know exactly which I have here, but I don't really care. 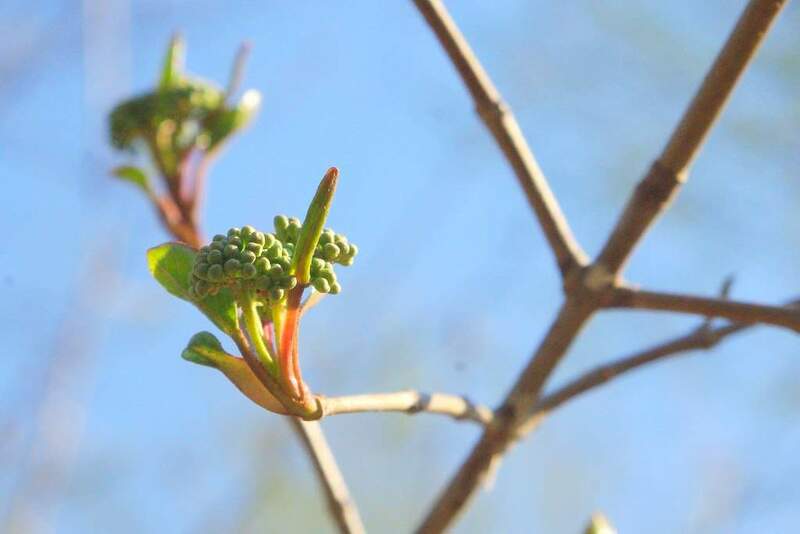 Blackhaw viburnum: big flower buds, tiny leaves. Bush honeysuckle: flower buds tiny, leaves already huge. Did I mention that the honeysuckle bushes hold on to their leaves much longer than most other trees and shrubs in the fall? Other plants just can't compete in the shade cast by these thugs. You can see that there's really nothing that grows underneath their arching canopy. 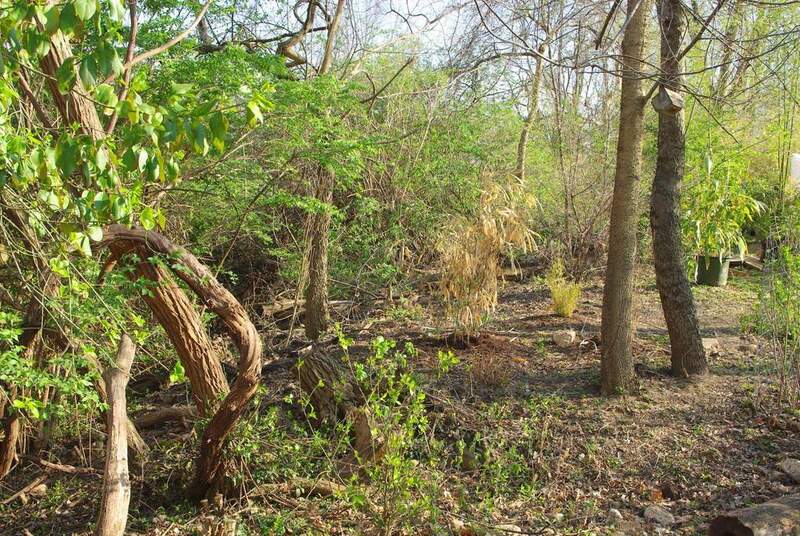 This is a common sight in the St. Louis area: bush honeysuckle dominating any wooded area. 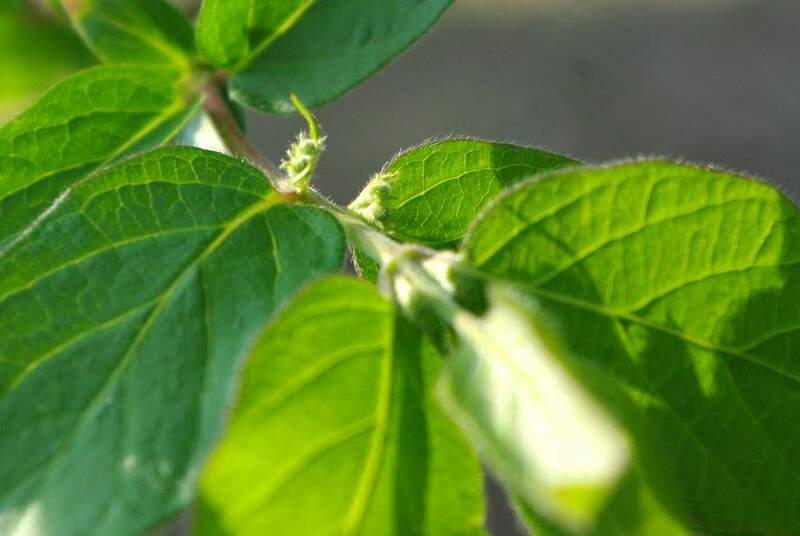 You see long stretches of them along the highways, bordering yards, around the perimeter of parks -- anywhere trees and shrubs are allowed to grow "naturally". Birds spread the seeds from the berries, and they grow quickly. Growing next to my veggie garden fence. 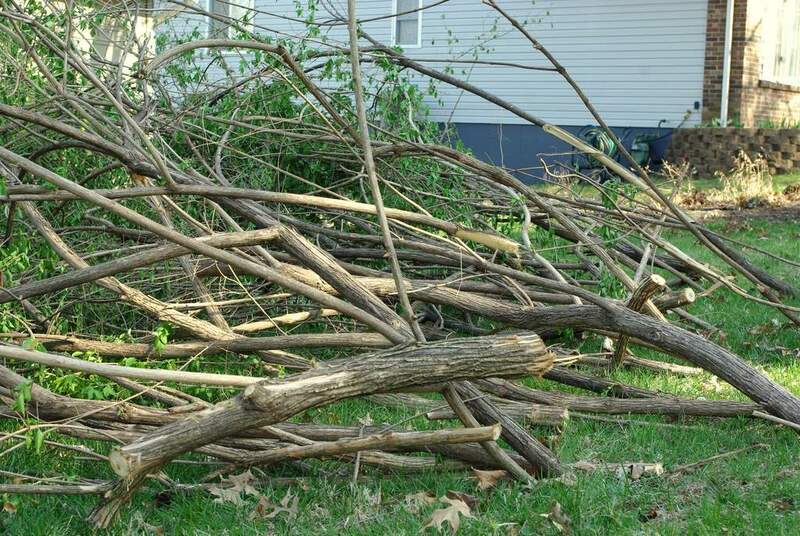 The main reason I was able to remove these invaders from my property was that our city started providing a twice a year free chipping service. So each spring and fall I'd cut down a few bushes, drag their unwieldy branches up to the street, and let the city chip them for me. I'd never be able to fit these into my own small chipper. Although I've removed all of them from my yard, in this post I'm going to tackle some that are technically not in my yard but are encroaching on it. The honeysuckle wood is tough and dulls chainsaws, and mine is already pretty dull, but I only spent 10 minutes at most cutting a few bushes down. The hard part is getting the interlocking branches pulled out and dragged uphill to the front yard. That took a lot of pulling! To make the job more difficult, the temperature shot up to 90ºF/32ºC on that day, making the long-sleeved shirt and gloves particularly uncomfortable, but necessary for protection. I wore shorts but paid for it with a few nice scratches on my legs. This is about 12" wide. Beautiful! So after an hour and a half (at least -- I lost track of the time) of branch hauling, the bushes were now a brush pile near the street, ready for the chipper. You know what might be good back here someday? River birches! 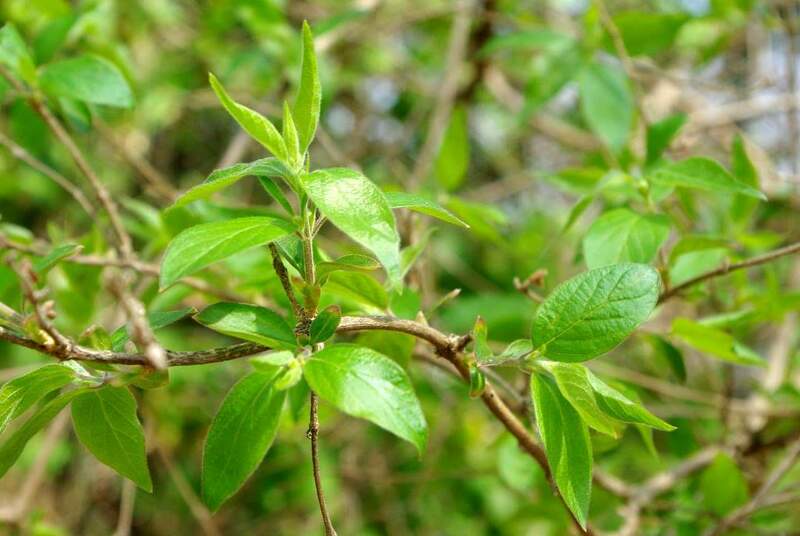 For more information about bush honeysuckle in Missouri, including a great "catalog" of native shrubs to replace the honeysuckle, look at this PDF from the Missouri department of conservation. I've got my own problems with Bishop's weed coming up everywhere. I really hate that plant! Based on the looks, your climate is just about 1 month ahead of mine as far as development of plants. BTW the spectabilis is finally making true shoots which will hopefully make it. M: normally I'd agree, but I don't want to have to cut these up into small pieces -- they really dull the blade! I've been taking down quite a few trees too ever since I started growing bamboo. The great part is that I can also make a few hundred bucks off the wood by putting it on craigslist. 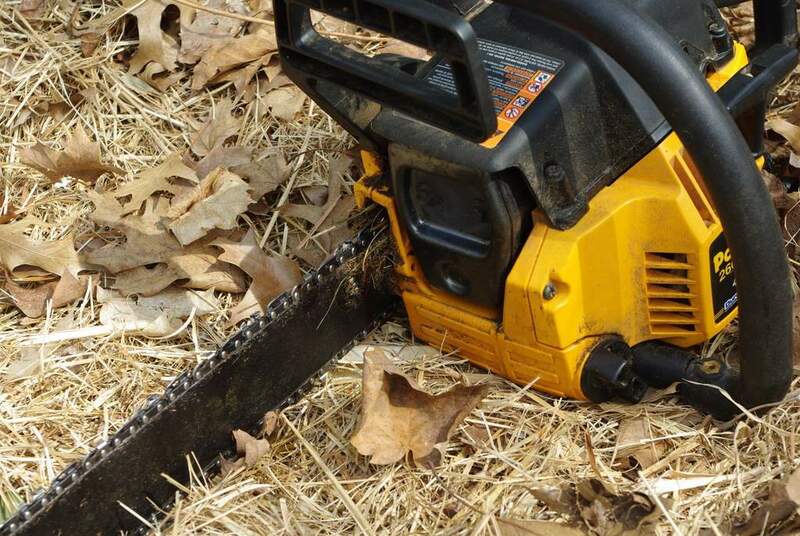 I use a regular electric chainsaw which is still powerful enough to go through 1ft diameter or more trunks with ease. Invasives, ugh. 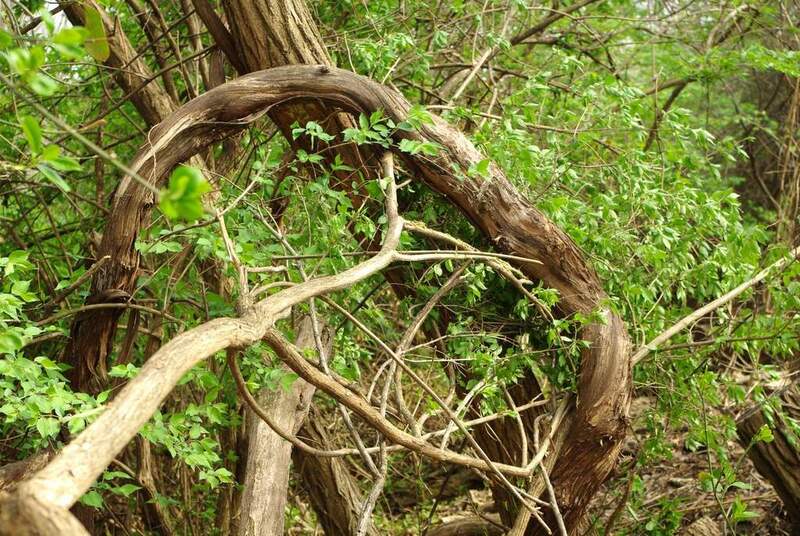 It's pretty awful seeing just how much it takes to get that giant woody vine out of your area. I'm glad you put such detailed information and photos in your post. Thugs -- what a great way to describe them. 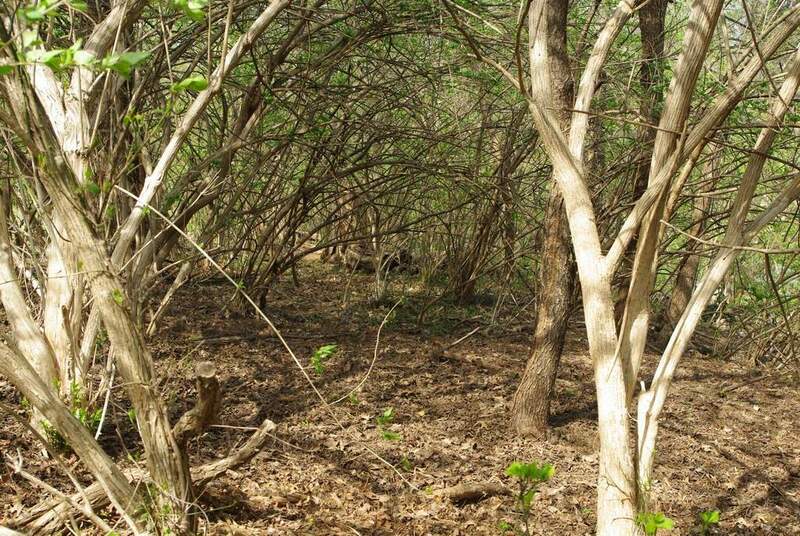 Meredith: these aren't the invasive honeysuckle *vines* (that we also have back here), but *bush* honeysuckle. Different plant, same "fun" to deal with. We have a vining native honeysuckle here that grows well when it's happy, but it's nowhere near as big as your bush honeysuckle. That's huge! 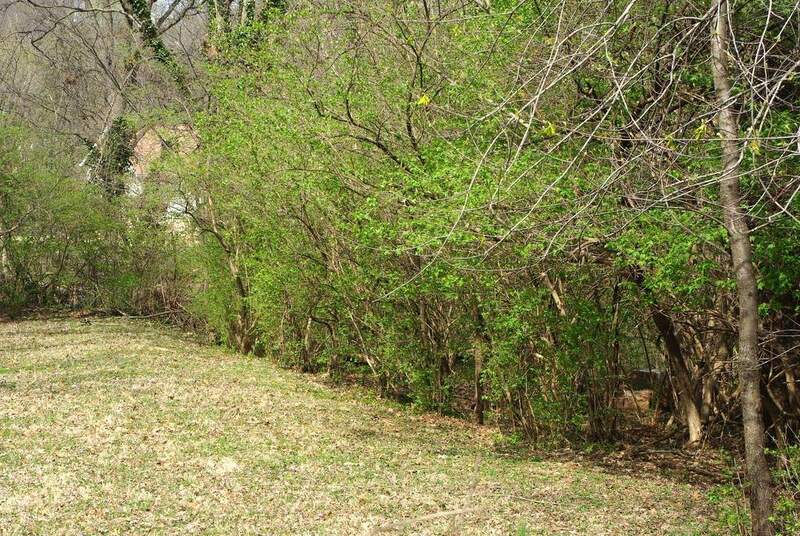 Looks like you've cleared a perfect spot for your new river birches! 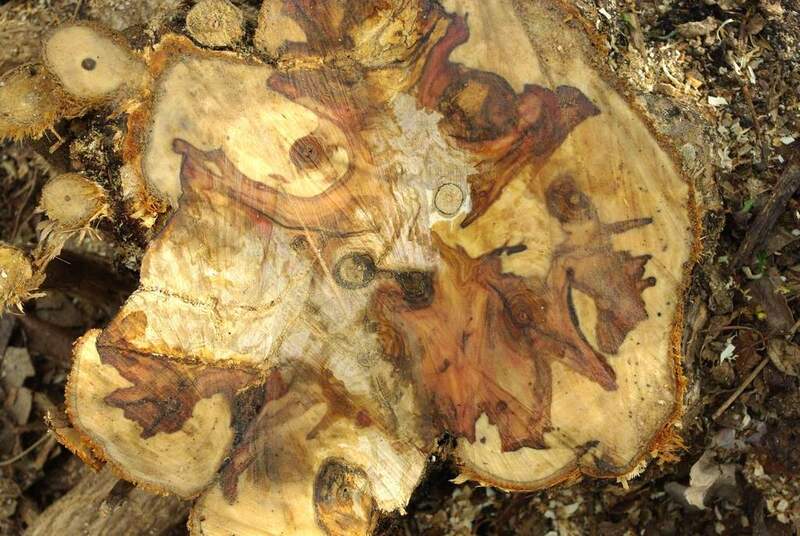 I have to say, that cross-cut across the stump revealed some beautifully patterned wood. I finally cut out the last honeysuckle bush in my yard. It took a lot of nerve since it hid my neighbors house. They are invasive and need to be torn out....if you have them...do your part!